Watching TV on a PC is just a matter of plugging in one or more TV tuners or a USB TV box and running the control software. While your computer’s screen might not be a sharp or as big as the television in your living room, Watching TV on your PC does mean you can keep an eye on what’s happening in the world while you’re at work or at play. It’s a doddle to archive recorded sport or TV shows to DVD, and network connectivity means you can watch on any computer in any room in the house. There are much kind of TV tuner cards available in the market. Such as DVB S2 card, DVB T2 card, DVB C card, analogue TV card etc. Now today we will introduce a new DVB T tuner card which is specially designed for receiving freeview channels in UK. Unlike other countries in Europe, most of UK locals get feeview TV. You might know freeview, you may be not know DVB T( digital Video Broadcasting Terrestrial). In another word, Freeview , Freeview+, Freeview HD is transmitted as DVB T/T2 standard. So if you want to get freeview TV, you might need a DVB T tuner card, rather than DVB S or DBV C card. 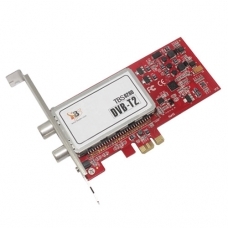 The TBS 6280 DVB T dual TV tuner card is a Freeview tuner card with PCI express slot. It supports dual tuners receiving with digital terrestrial television including both DVB-T and DVB-T2 standard, Giving 2 simultaneous HD terrestrial streaming from a single low profile card. All Freeview digital terrestrial (DVB-T & T2) TV and radio channels can be received by this Freeview HD tv card. The manufacturers include a small portable aerial with the DVB T2 tuner. However, how good these mini antennae are at picking up a solid signal depends on the coverage where you live. When we connected the TBS 6280 is a great freeview HD tuner to a proper aerial on the roof we found an impressive total of 70 TV and radio stations. Switching to a tiny indoor antenna that was packaged with DVB-T tuner, Placing the tidily antenna on the outside window sill we did far better, picking up 26 channels including such as BBC HD, channel 4 ,ITV, EPSN, CNN. There wasn’t a single TV station that we would choose to watch and the radio selection is good too. The good news is that TBS 6280 is ideal for Windows 7 Media Center, MythTV Linux ubuntu and other high end PVR DVB applications. The latest Linux driver works well with terrestrial DVB-T2 reception, It is a good DVB T card for linux and MythTV supporting. Every TV tuner comes with some sort of software to allow you to scan for stations, save favorite broadcasters, and schedule recordings DVR-style. TBS 6280 DVB T2 card comes with the compatible drivers for windows and Linux. It also contains some DVB applications, such as progdvb, TBSviewer,DVBviewer. You’ll be able to scan for channels, watch TV, pause and record from the comfort of your sofa with the added bonus of the interface on the screen and a decent remote control. On top of that you can expect that your tuner will come with a seven-day Electronic Programme Guide (EPG)in Freeview list. £103 is a reasonable price for a dual tuner card. Each tuner cost less than £ 55. It is so pleased to see the performance is great. Compared to Blackgold BGT3510, TBS 6280 has Absolute price advantage. It would be a great potential DVB T2 product in the recent market, Especially for UK market. 3.How to watch Freeview HD TV on windows media center?